The beautiful landscape of Uganda where oil must be excavated at once for financial profits. One-and-half years since Uganda and Tanzania signed an intergovernmental agreement for the East African Crude Oil pipeline – the start of what was supposed to be a smooth process to signing off other crucial documents such as the Host Agreement and the Final Investment Decision - the three main oil companies in Uganda say many of the critical numbers that should inform their decision of whether to put money on the table don’t make much business sense, writes JEFF MBANGA. The oil companies – Total E&P, Cnooc and Tullow Oil - want a revision of the terms they had earlier agreed upon. Their most interesting demand is for government to allocate all the available crude oil resources to the pipeline at the expense of a delay in building the oil refinery. As expected, government has balked at such a proposal. Due to this deadlock, Uganda’s oil industry is experiencing yet another bout of investor fatigue, with the patience of many businesses being stretched to the limit. According to a secret cabinet memo prepared recently by the ministry of Energy and Mineral Development, a copy of which The Observer has, one of the biggest bones of contention is the tariff that the companies are expected to charge for the transportation of the crude. Companies charge a tariff per barrel of oil in order to recoup their investments. More than a year ago when the three oil companies and government negotiated for the construction of the crude oil pipeline, it was agreed that the tariff would be capped at $12.2 per barrel for the 25 years that project would be in place. There was a provision that the tariff would fluctuate downwards but not breach the $12.2 per barrel cap. The tariff is supposed to factor in four main items: the oil resources moving through the pipeline, the capital expenditure, the operating expenditure, and the return on investment. However, it has emerged that in May this year, the oil companies had a change of mind over this model. “The business structure and assumptions of the pipeline project then supported this tariff. These key assumptions included: a one-period tariff structure for the entire life of the project of 25 years, ship and pay revenue mechanism, fluctuating tariff capped at $12.2 per barrel, and a pipeline throughput of 866 million barrels after the right of first call on volumes to the refinery has been met,” reads the cabinet memo. These assumptions, it has now come to light, no longer appeal to the oil companies. The companies now don’t just want all the available crude oil resources but a higher tariff too. The figure of 1.046 billion throws up another question: what happened to the 1.7 billion barrels of recoverable oil that government has long touted? The oil companies’ targeted rate of return is set at 10 per cent, which translates into a return on equity of 16 per cent. These figures, according to the ministry of Energy, are way too high, and has opposed them. Government says the return on investment should not exceed seven per cent. So, what if government rebuffs this particular demand from the oil companies over the tariff and sticks to putting up its oil refinery with a capacity of 60,000 barrels of oil per day, what then? The oil companies say this scenario leaves them demanding for a higher tariff. There are a number of viewpoints to interpret the oil companies’ decision to adjust what they had earlier agreed on. On one hand, this whole back and forth points to a growing fear that has for at least eight year engulfed Uganda’s oil industry: oil companies are worried about policy changes that create an unpredictable environment. For example, some oil companies have over the years been left uncomfortable by the amendments to Uganda’s income tax laws. Tullow Oil has over the last two years struggled to receive government approval for the sale of 21 per cent of its Uganda interests to Total E&P and Cnooc partly due to a difference in interpretation of tax laws. Then earlier this year, a Statutory Instrument – a policy tool - that sought to give Uganda’s government more power to regulate what private investors spent in the oil midstream industry, and how much costs they could recover, rubbed the oil companies the wrong way. The instrument, which Irene Muloni, the minister of Energy and Mineral Development, issued around June this year, was later withdrawn after Total E&P, Cnooc and Tullow Oil mounted pressure against the policy. On the other hand, the whole deadlock over the oil resources and the tariff for the pipeline shows the kind of oil politics that Uganda faces. Uganda, fighting to claim its place on the high table of Africa’s big oil producers, faces a daunting task of getting a number of stubborn oil companies to play by the rules the country has set for its oil industry. Dennis Kamurasi, the vice chairman of the Association of Uganda Oil and Gas Service Providers, says either way, Uganda’s oil industry will take off. The government maintains that “its position is that a refinery of 60,000 barrel per day capacity is developed given the fact that the projected demand for petroleum products in Uganda and the neighbouring countries will exceed 60,000 barrels per day by the time the refinery is commissioned in 2023. Uganda’s demand for petroleum products is currently at 36,000 barrels oil per day and is expected to grow at nine per cent annually over the short to medium term. To put all these disagreements to rest, President Yoweri Museveni has called for a meeting on December 12, where he is expected to make a make a final decision. It is, however, hard to see Museveni welcoming the demands of the oil companies, especially after government signed a framework agreement with a consortium of companies to build a refinery. Already, a team of Ugandan officials were in Italy recently to see off the start of the Front End Engineering Design studies for the refinery. All this work is premised on the assumption that the refinery will have a capacity of 60,000 barrels per day. Former Prime Minister Amama Mbabazi and Parliament Speaker Rebecca Kadaga are pushing for a bicameral legislature for Uganda and want an additional Upper House introduced. The proposal seeks to divide the legislators into two separate Houses, with directly elected members serving as a primary point of legislation, while the Upper House will offer advice and direction to the country on legislative matters. The plan was mooted at a dinner for MPs of the 9th Parliament at the Imperial Royale Hotel in Kampala on Friday night. The 9th Parliament ran from 2011-2016, with Mr Mbabazi as Leader of Government Business and Ms Kadaga as Deputy Speaker. Mr Mbabazi was invited as a guest speaker at the function that was presided over by Ms Kadaga. Mr Mbabazi said the Upper House will be composed of “knowledgeable former MPs and other personnel of expertise” to streamline the country’s socio-economic and political agenda. 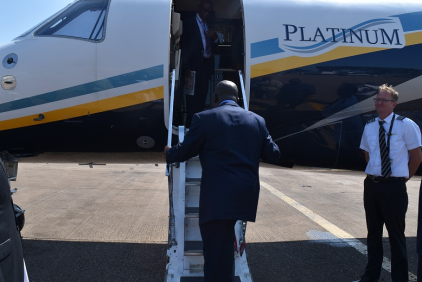 He also said as a Constituent Assembly (CA) delegate, he had proposed a Council of State as a second tier assembly but the idea was defeated on grounds of financial implications. The CA, which lasted more than a year (1994-1995) was established to discuss and debate the Draft Constitution and make a new constitution for Uganda. It was dissolved on October 8, 1995, with the proclamation of the new Constitution. “We should have a forum where people of wisdom, people of experience can channel in a practical way their collective skills, knowledge and experience for the benefit of the country,” Mr Mbabazi said. In the absence of such a forum, Mr Mbabazi said former MPs should form an association through which they will advance their views to the different policy making organs of the country, especially where they feel, things should be done differently. Mr Mbabazi was backed by Kabula County MP John Kakooza, who said debate in the 10th Parliament was cold because of absence of experienced legislators with institutional memory. “It is high time we thought of a second chamber of Parliament because this is a huge human resource with institutional memory,” Mr Kakooza said. He said he has done some research and had handed over the findings to Parliament for consideration. The Speaker, in her reply supported calls for a special chamber to accommodate such brains and expertise. “The Upper House is really necessary; there is so much knowledge in this body that we need to harness,” she said. Mr Mbabazi said in nation building, political differences need not interfere with the shared vision for posterity. Addressing Ms Kadaga directly, former premier Mbabazi said despite their known public differences, he has nothing personal against the person of Ms Kadaga. 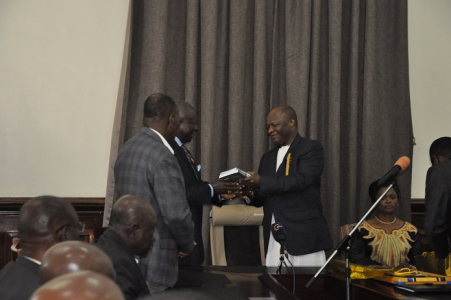 The Speaker also advised the MPs to always plan for their lives after Parliament. The need for a special chamber is also premised on fears that MPs become unemployable after losing their seats, despite their intellectual ability to constructively contribute to nation building. Former MPs asked Ms Kadaga to ask the President to redeploy them since some of them are still energetic. The forum for former MPs is chaired by Mr Tanna Sanjay, the immediate former Tororo Municipality MP. Justice James Ogoola of the Elders Forum said the MPs dilemma was self-inflicted. He accused them of making irrational decisions on the one hand and creating a false impression of themselves on the other. Justice Ogoola challenged the law makers to always plan for their exit, rather than living as victims of political enslavement. “The retirement of an MP is a dramatic thing, it comes at a time when you least expect it, it comes at a time when instead of rejoicing, you shed a tear or two,” he said. Progress. Twenty five years later, the kingdom has registered strides amid challenges that have shaped its existence in the current Uganda. Until July 31, 1993 when Kabaka Ronald Muwenda Mutebi II was enthroned as king of Buganda, the kingdom had almost lost hope for its revival. The kingdom was abolished after the May 24, 1966 attack at Lubiri that led to the exile of the then Kabaka Edward Muteesa II and a subsequent abrogation of the 1962 Constitution. After the Lubiri raid, it was required under law that: “the institution of king or ruler of a kingdom or constitutional head of a district, by whatever name called, existing immediately before the commencement of this Constitution under the law then in force, is hereby abolished”. But after marathon bush war talks that included Kabaka Mutebi visiting the then National Resistance Army troops in Luwero and post war talks, Buganda Kingdom was restored and Kabaka Mutebi crowned as king at an event at Nagalabi in Wakiso District that was graced by thousands of kingdom enthusiasts. 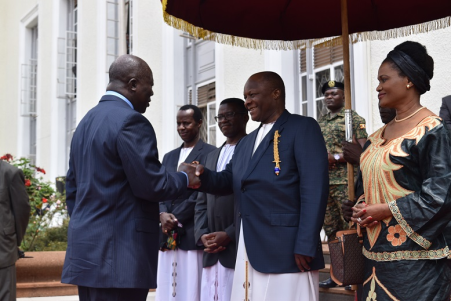 Kabaka Mutebi became the 35th – and currently the longest serving –king to reign as Buganda’s top executive since the kingdom’s founding in the 11 century by Kabaka Kato Kintu. Twenty five years later, the kingdom has registered strides amid challenges that have shaped its existence in the current Uganda. Hopeful of uplifting Kabaka Mutebi’s subjects in the face of abject poverty, deplorable living conditions, joblessness, environmental degradation, and food insecurity, the kingdom is being driven on five pillars that its administrators say will take Buganda to its former glory. 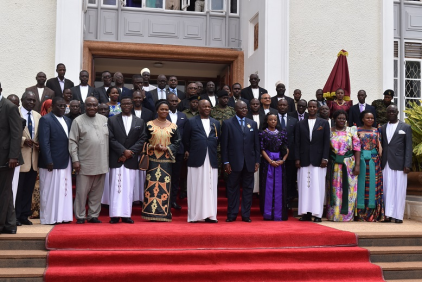 History has it that Buganda once topped other similar institutions in cultural, economic and administrative cohesion and political strength before the arrival of colonialists. Today, under the reign of Kabaka Mutebi, five pillars have been drawn in an attempt to regain that former glory. These include strengthening and safeguarding the throne (the king); power sharing through lobbying for federo (a federal system of governance); protecting kingdom land and all its boundaries; strengthening household income and advocating for unity. According to Kabaka Mutebi, such strategic interventions will lead the kingdom to greater heights. “Returning Buganda to greater heights requires explicit planning. We were once at the top and our people memorise how determination helped us during those times. We experience economic challenges but we will get to our destination,” Kabaka Mutebi said as he launched the 2018-2023 strategic plan early this year. Katikkiro Charles Peter Mayiga echoes these sentiments. He says Buganda’s future is a package of optimism under the reign of Kabaka Mutebi. “Our norms and culture are flourishing; administrative structures are stronger than ever; youth and women empowerment is taking root as is sports,” he says. He says strategic interventions to revive the agricultural sector, especially through growing bananas, cassava and coffee is underway while mainstreaming land management, health and education are on course. According to Mengo’s local government minister and attorney general, Mr Daudi Mpanga, Kabaka Mutebi’s reign amid the challenges that started in 1884 with the advent of the colonialists, is a big achievement. “He (Kabaka) has lived a unique life characterised by consistence and persistence. He has driven Buganda in the times of adversary even when there was no hope,” Mr Mpanga says. Kabaka Mutebi’s grandfather King Mwanga died in exile in Seychelles where he was sent by the colonialists. His own father, Sir Edward Muteesa II, also died in exile after the 1966 crisis. And Daudi Chwa also reigned under storm. “Our Kabaka has (so far) made a historical reference and his reign is nearly a whole generation. He is the longest serving king Buganda has had in history,” Mr Mpanga adds. Kabaka Mutebi’s reign is commonly referred to in Luganda as “omulembe Omutebi” and the kingdom has dedicated it to the youth. According to Mr Mpanga, many monarchs worldwide were destroyed but were never restored “but ours has miraculously existed. One of the core reasons we celebrate his capacity to see hope and possibility to restoration”. He says Kabaka Mutebi has set a pace for Buganda to fix on well thought targets and strategic planning through several engagements, advocacy and negotiations. Indeed, this has been visible in many ways where the central government Ministry of Health has engaged the kingdom to mobilise masses to participate in health campaigns such as immunisation, malaria fight, HIV testing and prevention campaigns. In April 2017, Kabaka Mutebi was appointed by the United Nations Programme on HIV/Aids (Unaids) as its goodwill ambassador in the fight against HIV/Aids, given the authority and respect he commands in Buganda. “Our local government structures have helped a lot in mobilisation and we are currently piloting dispute resolution and justice centres in Masaka, a project we hope to roll out in the kingdom,” he says. Mr Mpanga also admits that in the face of successes, Buganda faces stiff challenges such as unemployment, particularly of the youth, poverty, constitutional instability, land fights, and rural to urban migration. “But these are a result of a larger problem that was created by the colonial state that has failed us. Colonial governments have failed on community cohesion. We better get back to our native entities where people decide for themselves and created their (own governance) systems. These neo-colonial elites are not able to sustain our needs,” Mr Mpanga explains. He adds that for a solid, sustainable, prosperous, happy and peaceful nation, Buganda’s model will inevitably be adopted given the fact that it has withstood challenges. “We, the natives, will have to come up with our own solutions. Buganda is reservoir of many things,” he says. According Prof Ahmad Kasule, the acting Vice Chancellor of Mutesa I Royal University, Kabaka Mutebi’s reign scorecard has seen an improved education sector in the kingdom with a host of schools from primary, secondary, vocational training institutions and a university set up. “The Kabaka Education Fund provided 1,000 bursaries at all levels annually regardless of student’s origin and these are bound to double in the coming years,” he says. With institutions such as Buganda Royal Institute, a good number of youth have received vocational training and some graduates have been able to employee themselves. A professor of history and Kampala University Vice Chancellor, Badru Kateregga, says Kabaka Mutebi’s era has brought what had been lost - a country with a Kabaka where there was none and has cultivated persistence and dedication to the cause of Buganda: omwoyo gwa buganda ogutafa’ (Kingdom unending love). “All children born between 1966 and 1993 didn’t know about the kingdoms. His coronation revived what had been lost. Kabaka Mutebi’s era has educated children and reignited kingdom culture. People love their king,” Prof Kateregga says. “Kabaka Mutebi is important in the history of Buganda and a good seed for the future. His era is a seed of civility, love for culture, competitiveness and development,” Prof Kateregga says. The chairman of Imam Council in Uganda, Mr Sulaiman Guggwa, praises Kabaka Mutebi for his visionary leadership that has created a strong team of administrators at Mengo. “The kind of people Kabaka chooses for leadership posts are innovative and have helped in redemption of the kingdom. We don’t yet have enough self-funding but they have come up with fundraising innovations such as Ettofaali that have yielded good income to do projects,” says Guggwa. Through the Lukiiko and cabinet, strategies have been developed to start investment ventures and attract investors into the kingdom because big things start at small levels, according to Kateregga. City businessman Godfrey Kirumira says the kingdom is now full of investment opportunities in various fields of agriculture and real estate. “Through Emwanyi Terimba campaign, we are able to see an increased production in coffee growing and this is an opportunity for exporters,” Mr Kirumira says. In 1993 when Mutebi was crowned King of Buganda, the kingdom operated on a budget of Shs100 million that was donated by well-wishers. The budget trends over the past three years have shot to billions of shillings. In 2015/16, the kingdom operated a budget of Shs15 billion; in 2016/17 (Shs17 billion), in 2017/18 (Shs74 billion) and 2018/19 has Shs96.4 billion. “We are there because of strong systems, investments and reforms. We want to have a sustainable kingdom where we will fund projects with our own money,” says Mr Waggwa Nsibirwa, the finance, economic planning minister of the kingdom. Mengo now boasts of 16 enterprises, including educational institutions, media and tourism companies. “Transformational investment has enhanced youth employment. At least 10,000 people directly benefit from our investments but the multiplier effect puts the beneficiaries at 80,000 people because averagely a family has eight people,” says Mr Nsibirwa. The kingdom strives for financial inclusion and has emphasised value chains, according to Mr Nsibirwa. He says small Saccos have been created and members have created own cottages which generate income. With Chinese investors, the kingdom has constructed upper class residences – Mirembe Villas. More low cost houses are being proposed at Ssentema. At Mirembe Villas, 1,000 units are planned with facilities such as shopping malls, schools among others. Mr Nsibirwa says over the next five years, Mengo plans to run a budget of Shs500 billion and it will triple the current bursaries from 1,000 students annually to at least 3,000. A referral hospital for the kingdom and a demonstration farm will be put in place in every sub- county. Already, more rentable property, including Muganzirwaza, Masengere have been put in place to create income for the kingdom. The proceeds from the business ventures have helped generate revenue that is financing health and education sectors in the kingdom. The kingdom recently acquired a mobile clinic imported from the United States. Programmes have been put in place to uplift rural subjects through agricultural schemes. Coffee, cassava, banana planting is being emphasised to boost incomes. Mr Mayiga says over the past three years, Buganda Kingdom has mobilised farmers and at least 5 million coffee seedlings have been distributed in conjunction with the Uganda Coffee Development Authority. “We anticipate boosted incomes from coffee production while we also want to ensure household food security. We want to have vibrant communities who can take care of themselves,” Mayiga says. Mr Mpanga says the problems facing the kingdom are largely reflected in the wider society where constitutional instability and impunity have spared none. “Some individuals take it as if they are above the law and have caused land insecurity through evictions but also rural to urban migration, exploding population and poverty remain major challenges,” Mr Mpanga says. He urges natives to take the mantle to build a solid-sustainable kingdom to achieve long lasting peace, happiness and prosperity. Mr Nsibirwa says their development targets have been impeded by government’s reluctance to remit arrears worth Shs172 billion. “This revenue shortage has significantly impacted on our budget performance. We don’t know what will happen when another Shs500 billion currently under validation will be paid,” Nsibirwa said. In 2009, the kingdom faced its ugliest challenge when government stopped the Kabaka from visiting one of his counties, Bugerere, intercepting his advance team of Kattikiro JB Walusimbi at Ssezibwa, leading to clashes. The burning of the Kasubi Tombs in March 2010, whose reconstruction has taken too long, also remains a challenge. Ssaabasajja Kabaka Ronald Muwenda Mutebi II has bid farewell to his counterpart Asantehe Otumfuo Osei Tutu II, King of the Kingdom of Ashanti in Ghana, after a five day visit in Buganda where he was a special guest at the 25th coronation of His Majesty Ronald Muwenda Mutebii II.